Library Reading Program, Second Level for Nathan. Autumn Completes. The kids have really enjoyed the Library Reading Program this summer. Every night that we have time, I let both Nathan and Autumn select a book from the pool of library books. The kids seem so excited when I read them these two books before bed. 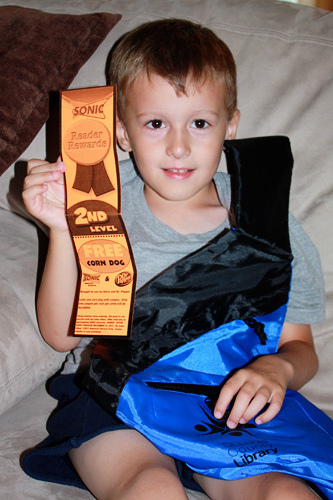 Nathan is at his second level, and won a Sonic Corn Dog and a sling backpack. Autumn finished her Library Reading Program (she was in the 0-2 program, so its a little different then Nathan’s) and she got a board book with kitties.